Here is a fun post to show you that even though you never expected to use garbanzo beans in baking, or absolutely love a dessert that is vegan, gluten-free, and free of sugar and oil, there are many ways to indulge on plant-based goodness, even for us with a sweet tooth. I encourage you to engage in social media sites like Twitter and Instagram for more plant-based inspiration. There is an amazing community out there and joining it is very rewarding. The food is beautiful! It is wonderful to see what people are doing and the diet is really catching on. Follow us at @forkfuloflove on Twitter for even more information on plant-based living, and see who we are following. I mention these sites, because it was on Instagram that I found the below recipe by @plantbased-pixie. 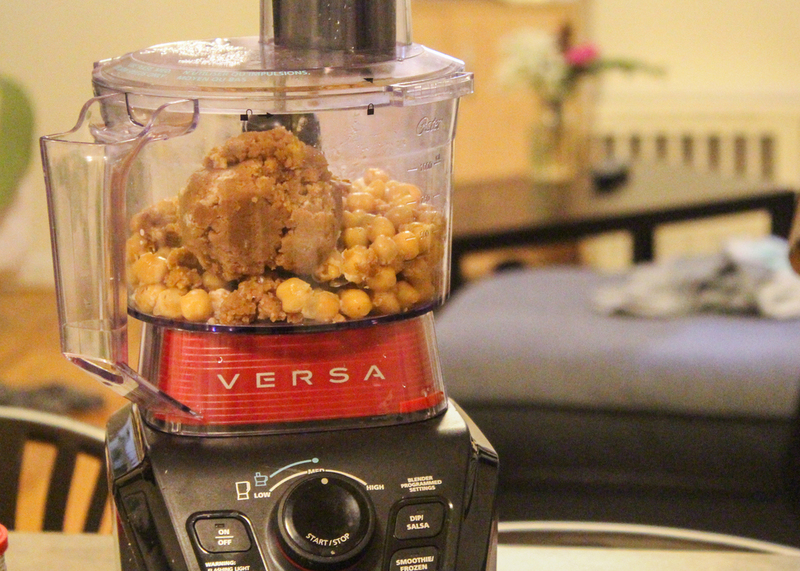 It caught my eye as the cookies looked delicious, and when I thought of the flavors of garbanzo beans and almond butter, I realized this could be awesome! The recipe actually calls for peanut butter, but I personally avoid peanut butter, because peanuts are very susceptible to contaminates, such as the mold, aflatoxin, which is a known carcinogen associated with liver cancer. We also know that peanuts is a very common allergy. I find peanuts to be a little controversial with a bit of disagreement on if they should be consumed or not, so in this paragraph, I have linked to a few articles that cite good research and present a balanced view. Personally, I have found that peanuts upset my stomach, and so do cashews, which are another mold-prone nut, so I stick mostly to almonds and the seeds, flax and chia, but also like walnuts, pine nuts, sesame seeds, and pumpkin seeds, and eat nuts in moderation. Although, the recipe did not call for homemade almond butter, I had been reading a bit about making almond butter at home, and I decided to give it a try for my cookies. To make your own almond butter, purchase a bag of raw almonds, soak overnight, and then blend in a food processor. The key is patience. It could take 30 minutes to an hour to turn nuts to butter, and there is a lot of monitoring the process. The nuts build up on the side of container and this should be pushed down with a spoon about every minute. The machine will heat up, but as long as the base is not overheating, it is fine for steam to rise from the inside of the container. I do not suggest leaving nuts processing unintended. Honestly, in the end, I would rather purchase the ready-made butter, but it's never a bad idea to try something new, to see if it works for you. I think extra time is worth it in food preparation if it increases nutritional value or saves costs, however, as long as you are purchasing almond butter with only one ingredient (raw almonds period), and purchasing almond butter at a good price (which should be between $8 and $10), I don't see a need to make it on your own, unless you enjoy the process! I'm sure if you look into sourcing almonds in bulk or from a co-op, you could save money, but I bought 8 oz of raw almonds from Vitacost for the same price as a jar of almond butter. It's pretty unique to find a cookie where you can eat 3 or 4 of without feeling any guilt! These cookies are vegan, gluten-free (totally grain free actually), sugar free (stevia only), and oil-free. They are also very tasty. Here is my recipe with a few substitutions. This recipe makes 12-15 cookies. Preheat the oven to 350°C. 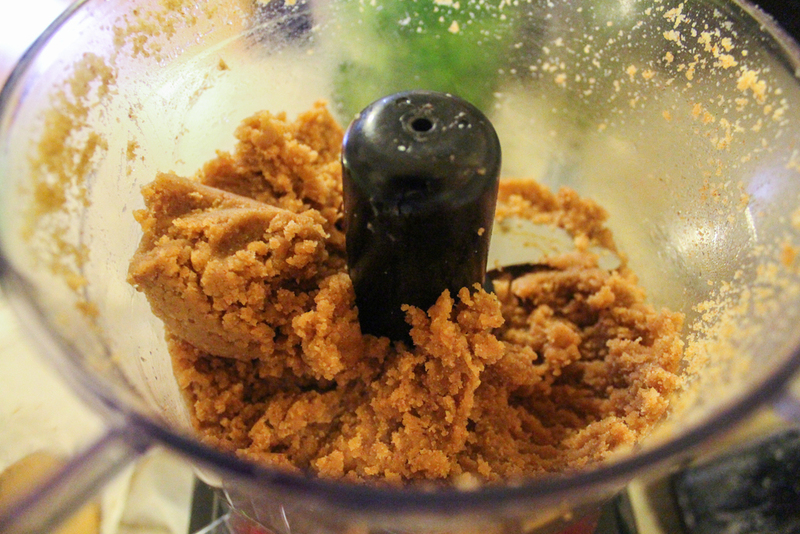 Gather all ingredients into a food processor and blend until dough-like. Use a tablespoon to scoop the dough into evenly sized and spaced balls on a baking tray, which you can line with baking parchment paper, but I did not use the paper and had no issue with the cookies sticking to the pan. I used stainless-steel baking sheets. Use a fork to press in a checkerboard pattern (like you would for Snickerdoodles), and bake for 20-25 minutes. As you can see I modified the recipe for substitutions such as almond butter, stevia, and pink Himalayan sea salt based on what I had and what I prefer. Baking is fun and provides a great opportunity for sharing! I remembered how my Mom and I would make Snickerdoodles at Christmas time. She was the one who taught me how to make a checkerboard pattern in cookies using a fork. These are beautiful memories that I cherish. On a plant-based diet you can still bake cookies with your loved ones and capture all of the warm feelings, but obtain better nutrition for you and those you love. Try baking these "plantful" cookies and share your new, healthy baking traditions with us below! After soaking, pour raw almonds into a food processor. Push down the sides and beware of the machine overheating. Smile and have fun! Scoop into a bowl and refridgerate until ready for use. Pull out all of your ingredients to measure out into food processor. Blend ingredients until a dough forms. Make sure to sneak a taste (no eggs, so the raw dough is safe to eat). Get your clean hands in there to seperate and roll dough out into delicious cookies. Give the cookies some space so that they can spread out a bit in the oven without touching. No uni-cookies, please. Just like my Mom's old Snickerdoodle recipe, press out a checkboard design for extra cute cookies. Bake at 350 for 20-25 mins until golden. Serve perhaps with unsweetened almond milk and share with a friend!